Group the honey drops by colour by turning the drops. 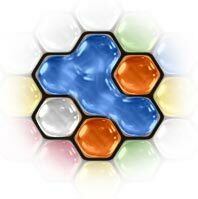 By clicking on a honey drop, the surrounding 6 drops will turn clockwise. You can make 25 turns in total. When a group of at least 4 drops of the same colour is created, they will merge together and disappear. The drops above will fall down and may form new groups. The more drops you clear, the more points you will score. After you have cleared the bee with the brush, the bee will come flying towards your cursor. Now you can colour a few drops in to the colour of the brush. This will not cost you any turns. Some honey drops contain a flower. When you clear these drops your score per turn will be doubled. On the left side, you’ll find a flower where the bee flies around when you score points. 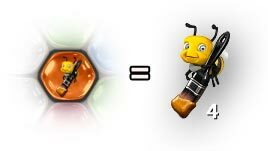 The more point you score, the higher the bee will fly and the further the flower will open! You have to score at least 50 point before the bee reaches the top. When he reaches the top you will get 50 bonuspoints.